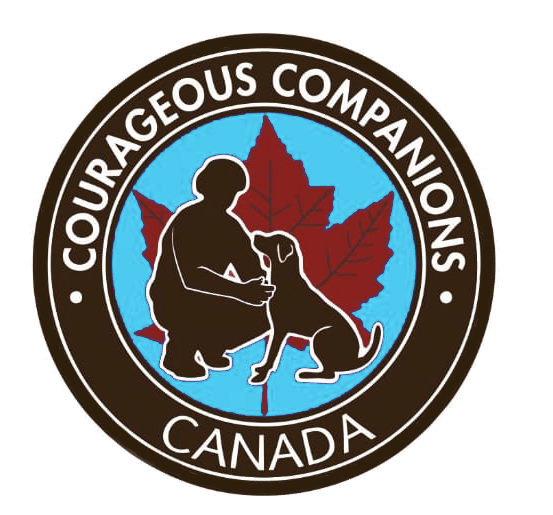 Courageous Companions’ signature service is a training program where certified dog trainers help identify, select, train and partner a suitable K9 with a Handler. Another method to enter the service dog program is where an individual trains their own K9 (called Owner-Trainers). The following information is meant to clarify and outline our policy for Owner-Trainers, and to provide information for individuals who may be considering applying to our programs under the Owner-Trainer path. It is very important for any person thinking about the Owner-Trainer path to understand that this is a very challenging undertaking. Over their decades of operations, MSAR (the CCI certifying body) has found the general failure rate of the owner-trained teams’ that are evaluated by MSAR is 80 percent. Comparatively speaking, teams that work with us through our signature service consistently achieve full certification. Seeing how much time, money and effort was being spent on unsuccessful teams, we wanted to know why. Our certifying body conducted an internal audit, so we could discover why the failure rate is so high. There were many reasons why there is only about a 20% success rate for Owner-Trainer teams. Consider in the general population, people have difficulties obedience training their dogs themselves and often go to obedience schools. This level of training is much lower than the standards expected of service dogs to operate in the public. Some people that have PTSD, anxiety or depression are unable to deal with the stresses of selecting, socializing, and training a dog in various settings. Canines innately detect this negative energy, which results in unstable dogs. A certified service dog must be able to undertake a minimum of 3 tasks to mitigate the disability of their handler. Owner-Trainers have found it very difficult to train their K9 to respond to their conditions or symptoms as the training requires the individual to be actively experiencing the condition. For example, some participants with PTSD have their K9 trained for nightmare interruption; a skill that is impossible to owner-train. The same is true for anxiety interruption, waking from medication induced sleep conditions, and many others K9 skills that are very helpful to a handler, but cannot be properly trained into the K9 by Owner-Trainers without a lot of help by a knowledgable trainer. In order to imprint tasks, use treat training methods, and to know when to dole out affection in order to reinforce the proper and positive behaviors assistance is usually needed to foster learning and a safe environment. This is critical to producing stable and receptive working dogs. Further, working with end-users to establish realistic and responsible goal setting is an important part of the process. Many people think that the Owner-Trainer path will be more economical because they already have a K9. Unfortunately, this is not true. We have found that Owner-Trainer teams cost just as much, if not more than teams that enter through our signature service. Why is that? Because frequent training setbacks caused by the reasons mentioned above require additional resources to get the team back on track. Once a team joins the program we want to see them succeed, and that often means partnering them with a qualified trainer to make up the difference in skill set. This is costly, since we pay our trainers fair rates for their time and skill. (FYI – A service dog fully trained and partnered with their Handler under our signature service costs $20K or more). Did you know that there are six types of PTSD? We specialize in training four of the six types of PTSD dogs to ensure the right fit for the handlers and their dogs. Owner-Trainers usually do not have the necessary trainer skills, have access to qualified mentors or a support system to help them train their dogs. A support network is also needed for ongoing success. It is important for individuals interested in undertaking the Owner-Trainer program understand that some breeds are more challenging to train as productive service dogs. This should be kept in mind, as the goal of undertaking this rigorous training program is to successfully graduate a productive and helpful service dog that will first and foremost help the Handler with their disability. Many individuals want to enter the program through the Owner-Trainer path because they have a pet that they already have a very strong bond with. An emotional bond with the K9 is a very important part of the trust relationship required for a successful service dog team. However, re-training and re-purposing the life of a pet into a service dog nearly always results in an unsatisfactory performing K9. The dog must be a minimum of six months of age and not older than four years of age. The dog must be spayed or neutered and microchipped before working in public spaces prior to full certification being granted. The initial assessment of the dog is done at pet-friendly locations wherever pets are allowed. This assessment also includes the Public Access Test. Dogs exhibiting severe stress, fear or aggression are disqualified. The next step in this process is that documentation is submitted to confirm that the individual has a disability. This information is protected under the province of The Freedom of Information and Protection of Privacy Act along with any other relevant information on the application form. Step three encompasses a mandatory probationary period whereby the service dog team works in public spaces with an MSAR trainer for 20 one-hour sessions with the dog in a training harness. The goal of these training sessions is to rule out any signs of dog aggression, fear, or severe stress. Handlers’ typically commit to participating in these training sessions once or twice a week over a three month period. Once the team has made it through the probationary period, the team then has to take a Public Access Test that spans over a two-day period. This test assesses the dog’s ability to remain stable and focused on its handler even when various stimuli are introduced. The dog cannot express any fear-based aggression. Successful teams are issued a harness. Next comes six months of intensive training with a local dog trainer who is willing to work collaboratively with MSAR. This whole process takes anywhere from one year to a year and half, before a final certification test is administered. Fully certified teams undergo a 3 to 5 day testing period depending upon the nature of their disability, life-altering injury, or chronic illness. This span of time builds in flexibility so as not to overwork the team or cause unnecessary stress or hardship. 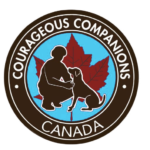 Re-certification of service dog teams depends on the type of disability. For example, a dog trained to work with a handler who takes seizures is assessed annually. Whereas a dog that works with a handler with PTSD is assessed every three years. Help is available when needed. Individuals that believe they are ready to be evaluated over a three to five day period may do so. In this case, the dog must be a minimum of two years of age, spayed or neutered and microchipped. Courageous Companions and our certifying body MSAR are dedicated to offering ongoing support. As a result, a virtual video series has been developed which is comprised of 167 comprehensive videos that walk people through this process one-step at a time. These resources are particularly helpful for people who live in remote areas who cannot access a local trainer to assist them and/or those who cannot afford to pay a trainer. We stand by our teams and truly want the Service Dog and Handler team to be successful.